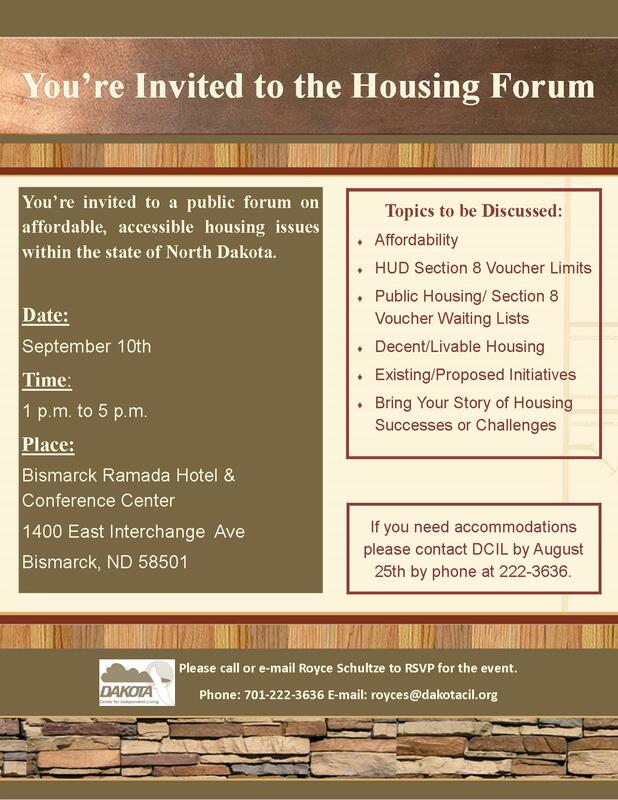 On September 10, 2014, the Dakota Center for Independent Living held a housing forum to discuss housing issues in the western part of North Dakota. 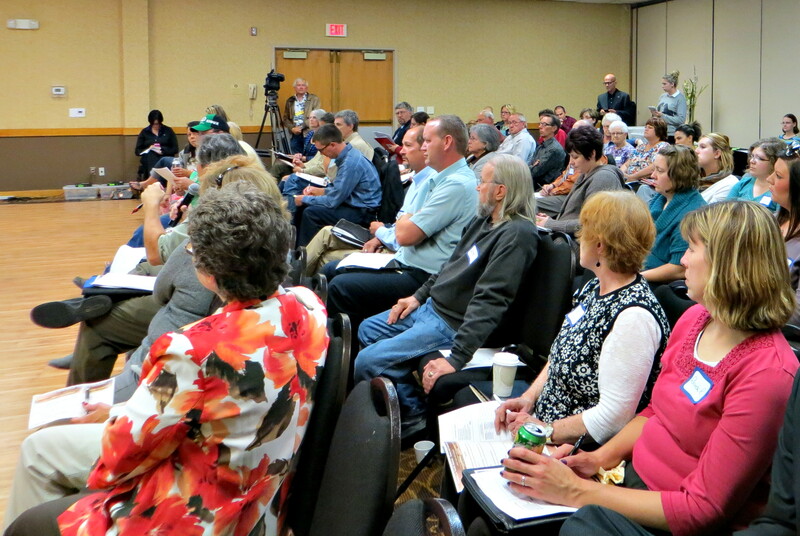 about 75 people came together from Bismarck, Williston, Minot, Dickinson, and other cities in the western part of the state. The high rent prices stemming from the oil fields is making it hard for people to find affordable housing. Affordable housing is defined as housing that costs 30% or less of your gross income. In Williston, the price for an apartment ranges from $1,000 per bedroom to $2,000 per bedroom. 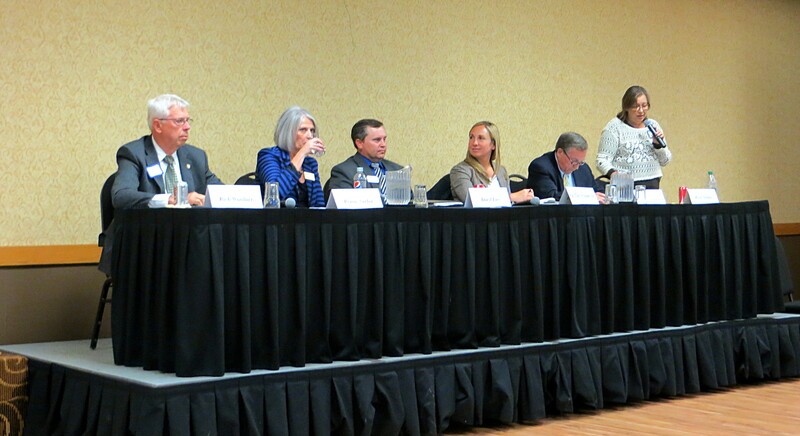 A presentation from the North Dakota Housing Finance Agency started off the event. This presentation discussed what affordable housing is, how affordable housing can exist, and also discussed many of the issues in the western part of the state regarding housing. One of the major issues mentioned is that the amount of housing being built cannot keep up with the need for housing. The North Dakota Housing Finance Agency discussed various subsidies and tax cuts that can be used to help build affordable housing as well as the challenges surrounding funding. After the presentation, people from the audience were invited to share their personal stories of housing challenges or housing success. 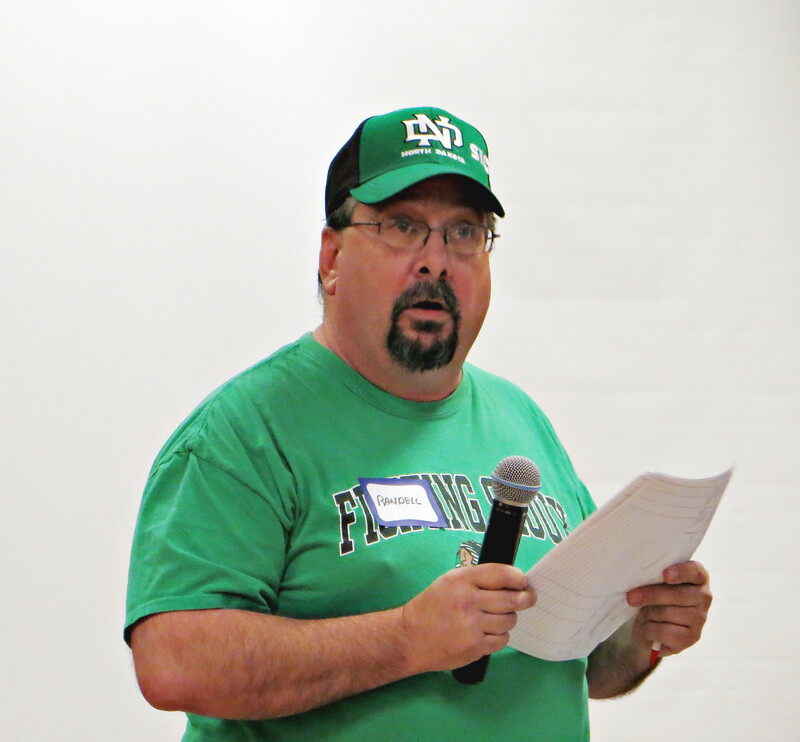 A single dad and resident of Williston who works in the oil fields brought not only his story, but the stories of those who could not attend. He discussed how his trailer court is raising the lot rent by 233%. He said he is lucky enough to afford it, but he sees the challenges of others around him. Many of the trailer courts in Williston are now requiring people to use only a specific brand of trailer in the court. This means that people who sell their trailer end up having to remove it from the park and replacing it with one of the allowed trailers. To read more about his story, click here. A man who works for legal services in Minot brought his story about how the law is causing more housing issues in North Dakota. He discussed how their is no way to get out of paying rent and many people are being pushed out of their homes due to the high rent prices. He has done some statistical work and found in Minot, evictions have gone from 67 evictions a year to over 197 evictions a year. He discussed how Minot is the next battle, because it won’t be too long before people can’t afford living in Williston at all. For many in Williston, people who own their home are unable to stay there because of the increased cost of living. To hear more of this story, click here. Local: Honorable Dennis Johnson, Mayor of Dickinson, N.D. The panel each shared their view on the housing issues in North Dakota before the panel was opened to questions from the audience. Some of the questions asked include homelessness, lack of affordable housing, lack of accessible-affordable housing, lack of housing for rehabilitated criminal offenders, lack of homeless shelters, section 8 vouchers, and many more. The FCC has issued a public notice to remind video programming distributors of their obligation to make information accessible to people with hearing or visual impairments in accordance with section 79.2 of the Commission’s rules. What does this all mean? Emergency information, including critical details regarding the emergency and how to respond to an emergency, needs to be accessible by everyone. There are no exemptions to section 79.2. While the FCC recognizes that emergency information is typically not available in advance and that it may be difficult for some stations to obtain closed captioning services, they want to make sure it is provided. It is important for emergency related information to be available and accessible to everyone. If you or someone you know has encountered emergency information that was not accessible to everyone and would like to file a complaint, contact the FCC. Often, people think of retirement when they think of Social Security. However, for those who have a disability that prevents them from working long-term, Social Security disability benefits can be the only dependable income source to help them deal with financial challenges of living without earned income. Over the last 15 years, the need for disability benefits has grown. However, approval rates for disability benefits have plummeted according to recent figures from the Social Security Administration. Now, almost two-thirds of all applications for Social Security disability get denied. Since 1999, the number of application has more than doubled. In 2009 and 2010, applications hit new peaks and the claim volume has only moderately leveled out. The Social Security Administration accepted more than half of all applications for disability in 1999, but the rate of approval dropped to 33.5 percent last year. Why has the approval rate dropped? Well, there is a misunderstanding of when Social Security disability benefits come into play. In order to be eligible, a person has to have a disability that lasts longer than a year and leaves a person unable to do the work the person did before or to adjust to other types of work. The Social Security Administration looks at a person’s ability to earn money from other employment as well as the severity of the disability and any specific medical conditions that caused it. The Social Security Administration also makes judgment calls about whether different, but related jobs could be options for you. Even if an applicant’s situation does qualify them for Social Security disability benefits, the Social Security Administration often rejects disability claims because of simple technical errors. This sometimes means they omitted required information or provided insufficient explanations. By collecting as much medical documentation as possible as well as work records can be helpful. When applying for benefits, it doesn’t hurt to enlist the help of an expert who understands the process. This can increase a person’s chances of getting approved. Affordable housing is a major issue in North Dakota. The North Dakota Industrial Commission has approved changes to the North Dakota Roots Program (Roots) to help more state residents become homeowners. 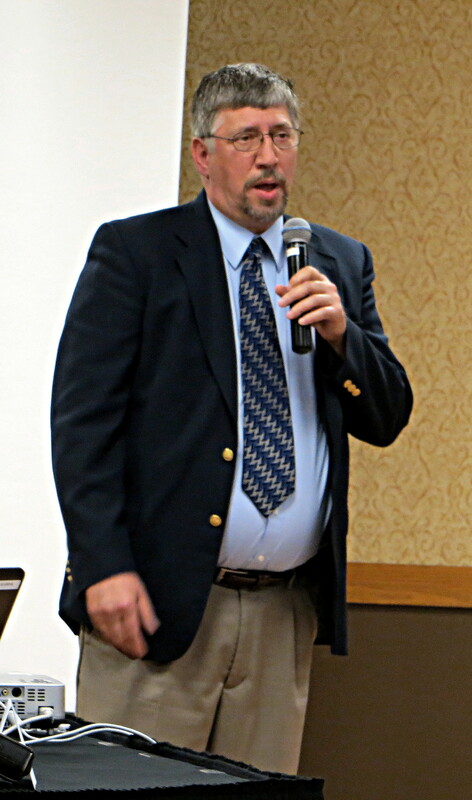 The program is administered by the North Dakota Housing Finance Agency (NDHFA). The rules for eligibility have been altered so that any North Dakota household earning up to 140 percent of the area median income to access NDHFA’s affordable interest rate loans, and down payment and closing cost assistance. By removing the restrictions on the Roots program, more individuals and families qualify for home purchase assistance from the North Dakota Housing Financing Agency. It is said the new Roots program will be popular with moderate income households that need down payment assistance to move from renting to home ownership. The maximum income limits for the Roots program are $97,440 to $110,600 depending on where the financed home is located. The Roots loan amount must comply with the current Fannie Mae/Freddie Mac conforming loan amounts or the limits of the applicable loan insurer/guarantor. You’re invited to the housing forum! If you are affected by a housing issue and live in North Dakota, we’d love to hear from you. 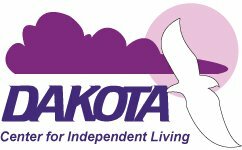 The Dakota Center for Independent Living is holding a Housing Forum on September 10th from 1-5 pm. If you’d like to attend, please RSVP by calling Royce at 222-3636.